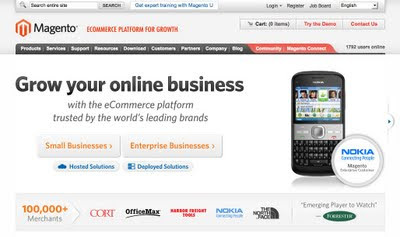 Magento was developed in PHP by a Los Angeles based firm Varien, and it is used by more than thirty thousand merchants. It provides secure and robust ecommerce solution which follows the Zend Framework coding standard. It is used by big stores such as Samsung and Nespresso, and has a huge community support too. Its community edition is free and you can easily download, install and use it. What’s more, its Enterprise Edition provides features to boost sales such as coupons, shopping carts and SEO provisions. You although have to pay for the Enterprise Edition. OsCommerce is one of the most popular open source shopping cart tools and it is free to use under the GNU General Public License. It has a user friendly interface and it is used by more than 228,700 stores online. It can be installed easily through internet and can be enabled automatically in minutes. There are no limitations on the addition of products in various categories. The look and design of the forms can be changed by the users too. OsCommerce provides support for multiple currencies and the payment processing is integrated to multiple payment gateways which include 2Checkout.com, ChronoPay, PayNova, iPayment, Paypal, SecPay, PSIGate and TrustCommerce. About 5,800 add-ons are provided by OsCommerce, however some of the add-ons are not free. Apache Ofbiz provides open source ERP, open source E- business solution, open source CRM, SCM, MRP and other online applications. It provides highly scalable and secure ecommerce solution which can be used either as an out-of-box solution or customized as per the requirements of the users. 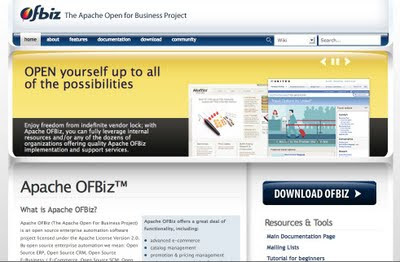 Additionally, Ofbiz offers flexibility to access the code and its Apache Software Foundation provides community support for all the open source projects. 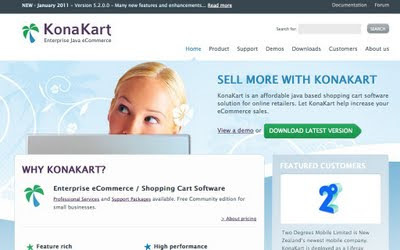 KonaKart provides free community edition shopping cart software for small businesses and you can get Enterprise Edition license for £3150 GBP per year. The customization code is provided as an open source, and it includes forms and classes providing payment and shipping modules. Some of the popular buyers of KonaKart are Tesco Mobile and Audi. KonaKart provides excellent shopping experience, promotions, SEO features, indexed searches, shipping, marketing, merchandising, analytical tools and internationalization features. 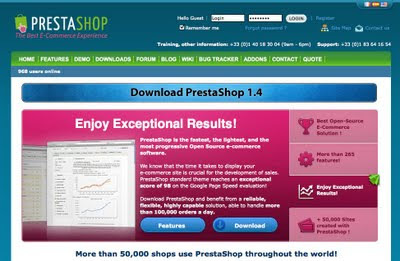 PrestaShop was launched in August 2007 and is written in PHP/MySQL. It offers complete online website, and has a software trial link, an integrated blog and wiki. You can download and use it for free. 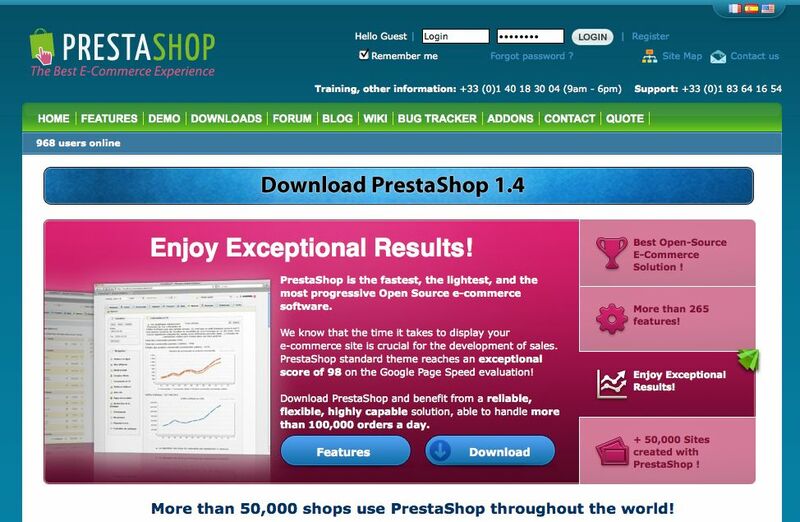 PrestaShop has more than 25,000 stores and provides CMS template, order status, customer evaluation forms, different payment modules and a huge community support. Moreover, the user supported forums have more than sixty thousand registered members. The monetary transactions made at the site can be directly sent to the bank account using latest security provisions. Jentla is a free open source e-commerce shopping cart application, which provides centralized system for management, and provides provisions for multisite text and image storage– a feature not found in other ecommerce applications. 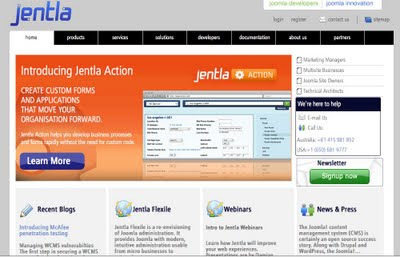 Additionally, Jentla has provisions for site grouping and personalization of forms. Zen Cart is designed for mid to big-sized stores, and provides open source solution with free installation. It has strong backend support and provides a HTML template system. Zen Cart is simple to use and has range of features such as email attachment, newsletter maker, options for pricing and a simple installation procedure. It provides provisions for certifications, referral tracking, and customer registrations. The payment gateway for Zen Cart includes PayPal and 2CheckOut. Batavi was built by a Dutch company and it provides free ecommerce solution. Its features include integrated product content, CMS and templates, and specific pricing based on customer groups. Batavi also has a huge community support. 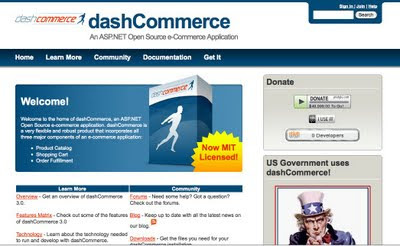 DashCommerce is built in ASP.Net and provides open source solutions. It has a powerful ecommerce solution which provides shopping carts, product catalogue, SSL based security, checkouts and order execution features. However, DashCommerce may not be suitable for small stores. Opencart is an open source shopping cart system which facilitates selling of multiple products simultaneously. Also, it can implement transactions in multiple currencies. You get 20 different options for payment and 8 modes of shipping as well. 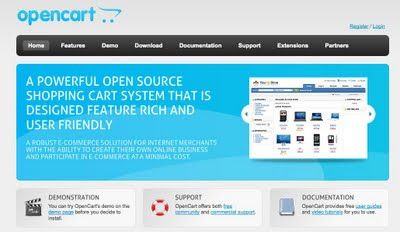 Besides, OpenCart is exceedingly user friendly and search engine friendly. There are a number of other free open source ecommerce shopping cart applications for business; however the feature sets and ease of use are not at par with the aforementioned applications. All in all, the 10 ecommerce shopping cart applications discussed above are the most reliable, easy to use and feature rich open source free applications available for your business presently. Hope you find this list useful, What is the best eCommerce shopping cart application you are using? Please don't forget to share with me in comments. Hi,I prefer & recommend zeuscart which is the best shopping cart software to create your store. Uniecommerce is another free & open source ecommerce platform to download. Design is pretty good compared to other open source platform. @robertflorish - Thanks for your comment. I will add this to my list. I need something with good traffic, great search engines, I want my product to be seen not just a great looking site. also usability is huge. I don't want something complicated. Why didn't X-Cart make your list? @Thomega - This post is trying to cover the OpenSource Shopping Cart Applications. I just browsed through the http://www.x-cart.com/ site and it does not look like a opensource. Let me know if its a opensource shopping cart? Broadleaf Commerce (BLC) (http://www.broadleafcommerce.org) is completely open source / Apache 2 license. Used by enterprises like The Container Store and Pep Boys, BLC is a great choice for highly customized eCommerce needs. Based on Spring and JPA/Hibernate, the engineers at BLC focus on flexibility, extensibility, and scalability as the primary goals of the platform. Really cannot understand how www.easybasket.co.uk is not on this list. Great post with best collection of ecommerce platforms..I prefer magento..which is very comfortable and secure buying for customers..
your coding is very need ful for me! I was used it. Thanks for the post! Just wanted to mention that a great free add-on that works with all of the carts you mentioned above is the Personal Bar - which is an E-Commerce add-on that floats at the bottom of your site's pages, designed to ease navigation, increase engagement and revenue. Nice collection. I’ve been using Magento for almost two years and I must say it is highly efficient open source ecommerce engine. I have used Magento and Zen Cart from these and I think they both works the best. Both are easy to use and provides you desired results to what one is looking for. EasyStoreHosting is best Online E-Commerce Store creation software. I have tried it, and it genuinely works. The best thing is that provide "technical support service" free of cost. So you have to do anything by yourself, just shoot a mail to them, they will do it for you. I've tried Magento for a while now and I can say that it's really great. It's super easy and efficient. I definitely recommended it to everyone. Among all I would highly recommend on Magento which is the most recommended extension from many top retailers. This is one among the best ecommerce platform. Always like to choose Magento, as it has fast growth in ecommerce industry. I would like to strongly recommend another ecommerce software called Uniecommerce, which is a multi merchant platform allows to create Deals, Auctions sites with effortless.